On Friday's we link up. 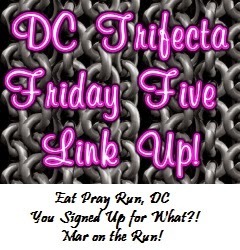 I am linking up with the lovely ladies of DC: Courtney at Eat Pray Run DC, Cynthia at You Signed up for What?, and Mar at Mar on the Run, as I do every Friday. This week's theme is "Five Fitness Inspirations". 1. This is a bit vague, but all of the blogs/twitter/instagram friends I've made these past few months. This means you, dear reader. I honestly can't just pick one person, as every single person I've encountered, interacted with, or just read tweets/blog posts inspires me. 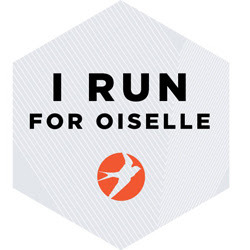 Most are faster, some are younger, some are older, some are coming back from injuries – everyone is going through their own thing, and I find that inspiring. The fact that day after day, you all are out there doing your best... now that's fantastic and it helps keep me motivated and inspired to keep running. 3. My active husband. He is the reason I started running. Granted, I took it to a whole new level with the races (and the need for something in my future to work towards/create goals for), which he isn't quite enthusiastic about. Though I haven't been inclined to go with him on any of his mountain climbing trips, I admire and am in awe of him for completing so many high peaks successfully. To be honest, he inspires me every day, because he is just generally awesome. 4. My husband's father. Umm... he's an Ironman, many times over, for crying out loud. Talk about inspiring. Mad props to that man. 5. The weather! Sometimes it's a run in the rain that I need, other days it's a breezy, sunny day in the 60s that makes me itch to lace up my shoes and hit the pavement. The fall is my favorite time to be running, with the changing leaves and the cooler temps, and though this year my asthma has been quite bothered with the turn in weather, I'm hoping it settles down soon. I'm not sure I'll ever be at that level. 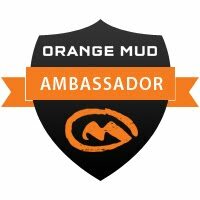 Completely in awe of anyone that completes one! I would agree with your list! That is impressive about your FIL. You are so right about the weather - good point! I totally feel inspired when there's a gorgeous day. Great list. Having the family members as inspiration serves double as a great support system. Great running weather right. Enjoy. That's so true, and a support system is very important (to me at least)! oh my gosh! your mom didn't start running until her 60s? that's amazing! Haha - right? She inspires me every day!